The DU-HA Tote fits in the back of most SUV's. Many vehicles including pickup trucks, will hold up to three (3) DU-HA Totes side-by-side in the rear cargo area or truck bed. Photo shows three (3) DU-HA Totes installed in the back of a 2015 Chevrolet Suburban. Drain channels are molded into the lid to help water drain off your Tote after it rains, after car washes, etc. Cup holders are also molded into the top of the lid and are convenient for picnics, camping, and tailgating. The Tote has 3 lockable latches, all of which can be locked using any standard size padlock. Close up of the latch open and securely closed. Lockable latches on the lid provide added security for your belongings. The rubber seal inside the lid helps keep out moisture and dust. Includes removable dividers and organizer / gun rack set. Also includes two (2) red utility trays with dividers to help keep your smaller items organized. 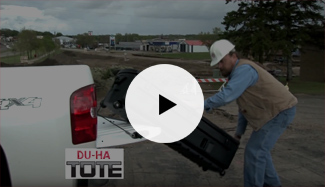 The DU-HA Tote is portable, made from heavy duty polyethylene, and is perfect for contractors, sportsmen, soccer moms, and everyone in between. The DU-HA Tote provides a safe and secure way to transport your firearms and will hold up to four (4) shotguns or rifles, with or without scopes, in an upright position, as well as ammo, and calls. Two (2) red utility trays with dividers are included. These trays fit securely above your firearms and the gear stored below. The included center metal brace helps maximize strength and stability of the Tote. If you need to move the center brace out of the way to access your larger items, simply lift one end of the brace out and rotate it to the side. Photo shows a close up of firearms stored in the DU-HA Tote using the included gun rack. Velcro strips are included to help secure your guns to the gun rack to prevent them from bouncing around on rough terrain. The back side of the velcro has a smooth surface so it won't damage guns. The Tote will even hold most golf bags. The locking mechanism on the bracket allows you to lock the Tote in your vehicle. Most standard padlocks may be used to securely lock the Tote to the Tote Slide Bracket. A Chevrolet Suburban will easily hold one (1) DU-HA Tote in the rear cargo area with one (1) of the back seats folded down. Two (2) DU-HA Totes will also fit easily in the back of a Suburban with the larger of the two (2) back seats folded down. Three (3) DU-HA Tote and Tote Slide Brackets will fit in the back of a Chevy Suburban with the back row of seats folded down. The included pull strap can be attached to the handle on either end of the Tote. This allows you to pull the Tote behind you on all four wheels. The DU-HA Tote makes it easy to take your items with you. The DU-HA Tote is the perfect gun case for taking your guns and gear out duck hunting. Photo shows both the DU-HA Humpstor and the DU-HA Tote installed in a truck bed. The DU-HA Tote is ideal for construction workers. Leave it in the back of your vehicle or take it with you on your job site. The wheels make it easy take your tools in with you. Perfect for fire fighters. The DU-HA Tote and the Humpstor both fit easily in truck beds at the same time to provide lots of extra storage for emergency gear and essentials. With the Tote Slide Bracket installed, gear can be slid out towards you easily when you need it. Take the DU-HA Tote in with you when you stay at a hotel for the night, attend a conference, or exhibit at a tradeshow. Equestrians, cowboys, cowgirls, and horse lovers use the DU-HA Tote for hauling their horse cleaning gear, tack, and supplies to rodeos, events, and shows. Even with a horse trailer attached to the hitch, you can still easily access the DU-HA Tote and the gear you have stored in it. The DU-HA Tote also fits in many horse trailers.